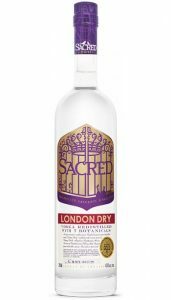 Is unique to Sacred Spirits we own the IP rights no other distiller can make a London Dry Vodka in Great Britain and, like Sacred Gin, is distilled under vacuum. As a result, freshness is key to its distinctive character, together with a gentle spicy warmth from the Indonesian cubeb berries and Indian nutmeg from which it is made, along with 5 other spices – but it does not include juniper and so is not gin! Crystal clear. Clean delicately spicy nose with faint aromas of fennel, nuts, dill and aniseed. Superbly balanced, very delicately spiced palate. The spice notes are present in levels low enough to add interest and delicate flavour while integrating with grain spirit notes rather than dominating. Flavours of pine needle, lavender and brazil nuts. Peppery spirit spice sits well with the peppery cubeb berries. Yes it’s spiced but delicately so. Cleansing, strangely sweet lingering peppery finish with cleansing aniseed and eucalyptus. It was awarded a 5 out of 5 by Diffordsguide.